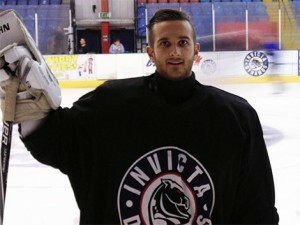 23 year old shot stopper James Richardson will deputise for Damien King in 2016/17 after the netminder penned a deal that will see him make his debut in the NIHL South Division 1’s top tier. In his career so far James Richardson has risen through the junior ranks in Bracknell, Guildford and Swindon and he featured for both the under 16s and under 18s in Wiltshire before appearing for the Wildcats in the ENIHL South Division 2 (now the NIHL) in 2008/09. As a promising young netminder he made the school of excellence each year before putting his hockey on hold to attend university from 2010 onwards. Now the shot stopper is ready for a return to the game and he has been preparing for an NIHL South Division 1 berth with intense training over the last six months including sessions alongside the renowned Nathan Craze, Stevie Lyle and Mark Beggs. After his graft 2016/17 will see him tested by the best the NIHL has to offer as he deputises for Damien King having agreed terms for the campaign with Head Coach Kevin Parrish. Speaking on the arrival of James Richardson, Kevin Parrish said, “James spoke to me during 2015/16 when Steve Nightingale opted to move on and we have been in contact ever since. After a break from the game for university, James has been working hard to ensure he’s up to the challenge of the NIHL South’s top tier and he is determined to make his mark with the Dynamos in 2016/17. James has been working with Nathan Craze and Mark Biggs throughout the summer and, having spoken to both, I feel he is the right guy to come in and deputise for Damien King this season. James is excited to be a part of the club and I’m sure he will be keen to impress when his chance arrives between the posts”. 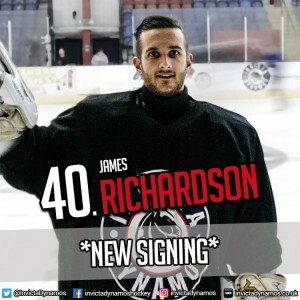 New goalie James Richardson will wear number 40 for the Mos and his capture means the team are now ready to go for 2016/17 with their first outing now just a week away. The Dynamos will take on the Haringey Racers in London on Saturday 3rd September before hosting the same opponents the following night in the second of two warm-up fixtures before the competitive action begins a week later. Warm-up Jersey – For just £125 get your name or logo printed on the back of James Richardson’s warm-up jerseys. Sponsors are then presented with the jersey to keep at the end of the season. Game jerseys – Get your name or logo on the back of James Richardson’s game jerseys and become a part of the action.